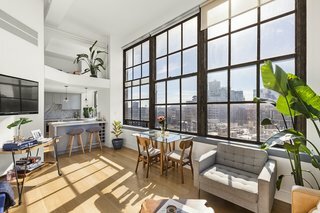 These airy modern lofts take apartment dwelling to new heights. Take a peek at the elevated homes from the Dwell community that caught our editor's eye this week. 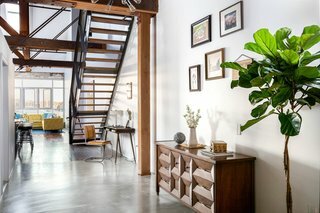 From the design and build company: "This modern loft in Downtown LA was completely remodeled with some unique details such as concrete polish floors on entry way, new wood floors on living room, modern flat panel cabinets on the kitchen and a spacious and bright master bedroom." From the project uploader: "In the heart of ‘s-Hertogenbosch, a former office and workshop was completely renovated and converted into a loft. Because the building is 20 meters deep and really only has light at the front and rear, access of daylight has been an important theme. The explicit wish of the client was to be able to enjoy the property as one large space. Various voids/vides were introduced that allow daylight to penetrate deep into the home. The voids provide glimpses between the various residential functions themselves. 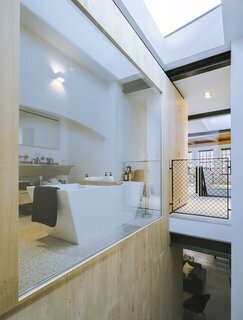 The functional elements such as bathroom, toilets, storage room and kitchen are grouped in one large timber volume that also connects the floors. From the bath you can look right through the void into the sky." From the architect: "This modern loft with a one bedroom, one and one half bathroom, is located in a converted brick and timber building. To secure items for the client to rent the space while away, we designed a state-of the-art pull out locking bike rack and storage behind the TV. Other custom items include pull out dog bowels in the kitchen casework, a the master bathroom door that turns the glass wall door into the cube shower enclosure and a custom designed steel and glass desk that over looks the living space." From the contractor-matchmaker: "[This is] a corner, pre-war loft on a main street in Greenwich Village [featuring] southern and western exposures, and oversized, industrial windows that wrap around two sides of the loft. 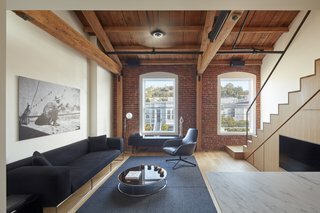 The space features 14-foot-high ceilings; a mezzanine above the kitchen is accessible via a charming spiral staircase and can be used as a guest bedroom or home office.The homeowner saw an opportunity to add value to the apartment by taking advantage of its structural beauty and abundant natural light. The building was converted in the late '70s from an industrial manufacturing space into residences and the unit had been relatively untouched since. A few tweaks to the layout maximized the space to its full potential as an investment and a primary residence." 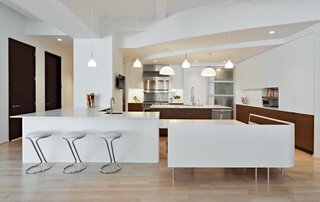 From the architect: "Renovation and reconfiguration of a 4500 sf loft in Tribeca. The main goal of the project was to better adapt the apartment to the needs of a growing family, including adding a bedroom to the children's wing and reconfiguring the kitchen to function as the center of family life. One of the main challenges was to keep the project on a very tight budget without compromising the high-end quality of the apartment."